Involved in base excision repair of DNA damaged by oxidation or by mutagenic agents. Acts as DNA glycosylase that recognizes and removes damaged bases. Has a preference for oxidized pyrimidines, such as thymine glycol, formamidopyrimidine (Fapy) and 5-hydroxyuracil. Has marginal activity towards 8-oxoguanine. Has AP (apurinic/apyrimidinic) lyase activity and introduces nicks in the DNA strand. Cleaves the DNA backbone by beta-delta elimination to generate a single-strand break at the site of the removed base with both 3'- and 5'-phosphates. Has DNA glycosylase/lyase activity towards mismatched uracil and thymine, in particular in U:C and T:C mismatches. Specifically binds 5-hydroxymethylcytosine (5hmC), suggesting that it acts as a specific reader of 5hmC. 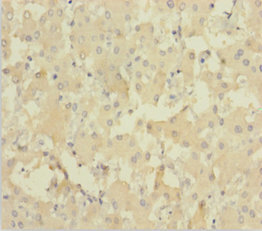 NEIL1 Polyclonal Antibody. Unconjugated. Raised in: Rabbit.